Opening Reception April 4, 2019, 5:30 - 8 pm. 647 Irving Street, San Francisco. Currently participating in the "Celebrating Women" show at SFWA. Received a Juror's Award for one of my pieces that was included. This runs for the month of March, Women's History Month. This show focuses on Conceptual Craft. The Spring issue of Vistas and Byways is still online. I am showing work at the "Point of View" show from May 8 - June 2, 2018 at the San Francisco Women Artists Gallery. The work I am showing is from my "Shopping" series, black and white photographs. 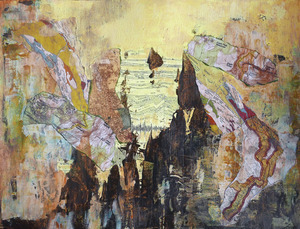 I am participating in the "World of Abstractions" exhibit at the San Francisco Women Artists Gallery. I received a Juror's Choice Award for my piece, "Night and Day." "Night and Day" started as a doily which is soft and white and comes from my grandmother's generation. It has been combined with a hard, dark background, which is its digital support. I am always drawn to black and white photographs and enhanced the soft and hard portions of the composition by making turning them into dark and light.